Andrew Wakefield and his supporters at the General Medical Council investigation where he later lost his medical license. Despite there being no evidence showing a link between vaccines and autism, rumors about the connection persist. Vaccinated children develop autism at the same rate as unvaccinated children. Avoiding vaccines because of the persisting myth that they cause autism is dangerous. While it won't prevent a child from getting autism, it also won't protect them from vaccine-preventable diseases that can challenge their health and be spread to others. A study by Andrew Wakefield, which has been retracted, started the debate about a link between vaccines and autism. Mr. Wakefield's medical license has since been revoked due to conduct considered dishonest and irresponsible. A scientific review by the Institute of Medicine (IOM) concluded, "the body of epidemiological evidence favors rejection of a causal relationship between the the measles-mumps-rubella (MMR) vaccine and autism. The committee also concludes that the body of epidemiological evidence favors rejection of a causal relationship between thimerosal-containing vaccines and autism." A 2012 report, also by the IOM notes, "few health problems are caused by or clearly associated with vaccines" and "the evidence shows there are no links between immunization and some serious conditions that have raised concerns, including type 1 diabetes and autism." In one of the largest studies ever, researchers analyzed medical records of over 95,000 children, more than 15,000 who were unvaccinated at two years of age and more than 8,000 who were age five and unvaccinated. About 2,000 of the children were considered high risk for autism because they had an older sibling with a diagnosis. The researchers found no evidence linking the MMR vaccine to autism even in the children who had an increased risk for the disorder. During follow-up, researchers found 1 percent of the children studied were diagnosed with autism and of those who had an older sister with the disorder, 7 percent were diagnosed. These findings were consistent with previous studies. Newer research is pointing to a genetic basis for autism and suggests that autism might occur before a baby is even born. One study from Japan looked at the MMR vaccine, which was withdrawn from the country due to concerns about aseptic meningitis. In that study, at least 170 children were found to have developed autism even though they had not received the MMR vaccine. Another study published in the February 2014 issue of the journal Autism found, "the rates of autism spectrum disorder diagnosis did not differ between immunized and non-immunized younger sib groups." One 2018 study reported in JAMA Pediatrics aimed to determine vaccination patterns of children with and without autism, as well as those of their younger siblings. The researchers determined that the children who had autism and their younger siblings had higher rates of being un- or under-vaccinated. This, the study authors note, suggests that these children are at higher risk for vaccine-preventable diseases. So, while there is no proven benefit of avoiding vaccines in terms of autism prevention, this research highlights a proven danger of doing so. Autism is lifelong disorder that causes problems with behavior, cognition and social interaction. While researchers still don’t know what causes the disorder, there has been no scientific proof that vaccines cause autism. Of course, the decision to vaccine is up to each family. But most doctors and researchers recommend vaccination because numerous studies prove the benefits to a child’s health outweigh any risks of vaccinating. Get your child vaccinated to prevent complications related to preventable diseases, such as the measles or polio. And if you're scared about the affect a vaccine may have on your child's health, talk to your child's pediatrician. Abu Kuwaik G. Immunization Uptake in Younger Siblings of Children With Autism Spectrum Disorder. Autism. 2014 Feb;18(2):148-55. DOI: 10.1177/1362361312459111. Anjali J, Marshall J, Buikema A, et al. Autism Occurrence by MMR Vaccine Status Among US Children With Older Siblings With and Without Autism. JAMA. 2015;313(15):1534-1540. DOI:10.1001/jama.2015.3077. Children’s Hospital of Philadelphia. Vaccines and Autism Updated May 7, 2018. Ford A, Rusch E, and Clayton EW. Adverse Effects of Vaccines: Evidence and Causality. Washington (DC): National Academies Press (US); 2011 Aug.
Godlee F, Smith J and Marcovitch H. Wakefield’s article linking MMR vaccine and autism was fraudulent. BMJ 2011; 342. DOI: 10.1136/bmj.c7452. Honda H. No Effect of MMR Withdrawal on the Incidence of Autism: a Total Population Study. J Child Psychol Psychiatry. 2005 Jun;46(6):572-9. DOI: 10.1111/j.1469-7610.2005.01425.x. Zerbo O, Modaressi S, Goddard K, et al. Vaccination Patterns in Children After Autism Spectrum Disorder Diagnosis and in Their Younger Siblings. JAMA Pediatr. 2018 May 1;172(5):469-475. DOI: 10.1001/jamapediatrics.2018.0082. 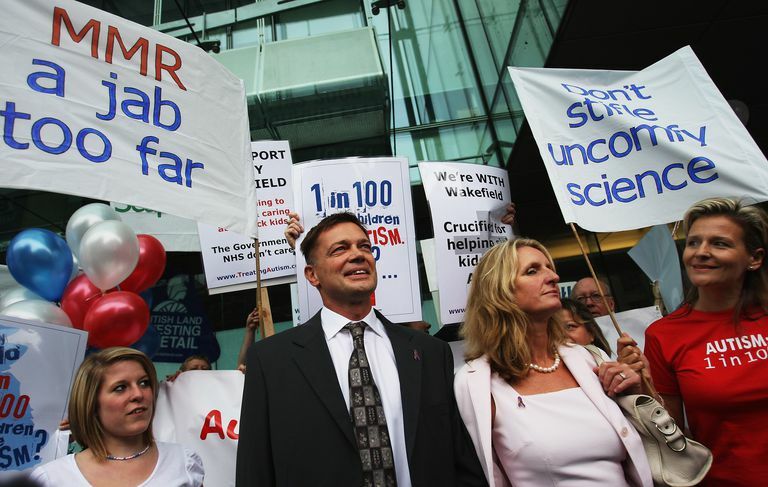 Why Is Andrew Wakefield Such a Potent Force in the Autism World?